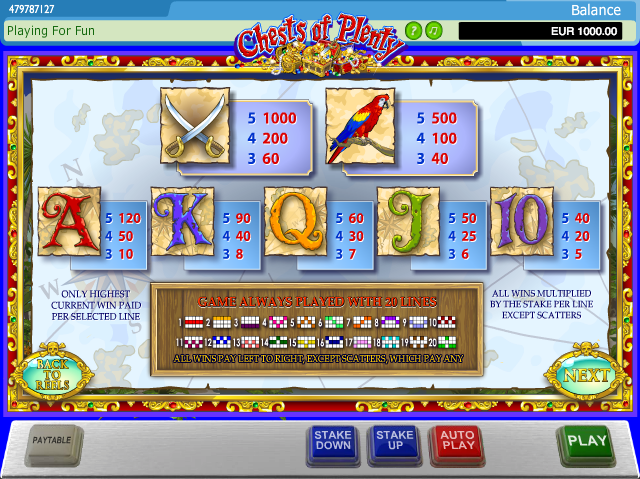 Pirate-themed online slots always provide plenty of entertainment and thankfully that’s also the case with Chests of Plenty from Ash Gaming; there’s a not-very-subtle double entendre in the title as well as not only does it refer to chests of treasure, it also alludes to the prodigiously proportioned female pirate who wields the flintlock pistols. A progressive jackpot adds to the fun. Chests of Plenty features five reels and twenty paylines and everything about this game is designed to place us in the Caribbean in the days of pirates, privateers and scuffles between the colonial powers. Beyond the reels we can see a beach framed by palm trees and galleon moored in the distance. The soundtrack features sea shanties and plenty of ‘Yo Ho Hos’. Thankfully some creativity has gone into designing this feature and to trigger it all you need to do is land three, four or five of the Map scatter symbols anywhere on the reels. The idea is to move between three progressively more valuable maps to collect prizes on the way. Movement is accomplished by spinning the captain’s wheel to determine the number of moves around a board. That board contains prizes, maps and a skull and crossbones which means game over; collecting three maps moves you to the next island. Those islands are called Booty Island, Isle of Plenty and Jackpot Island. A quicker way to get to the more lucrative islands is to land four or five scatters which will start you on the Isle of Plenty of the Jackpot Island respectively. Our blonde pirate has the ability to turn the pirate wild is she lands to the immediate left or right of him on the reels. Landing three of the Treasure Chest scatter symbols anywhere on the reels will begin this bonus feature and there’s also a chance of winning the huge jackpot. The chests will come to the front of the screen and open up, revealing different jewels; matching jewels will win you a prize and another go, no match will end the feature. 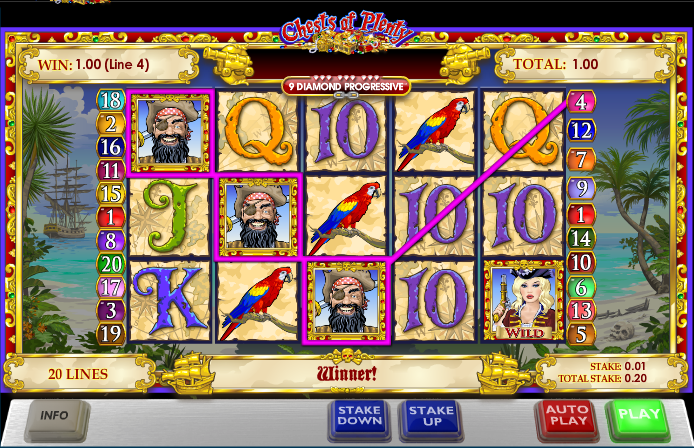 If you are lucky enough to land nine diamonds – three in each chest – you will win the progressive jackpot. This is great looking slot with superb sound effects and a couple of creative bonus features; the progressive jackpot adds some extra appeal if any were necessary for those who like a shot at the big bucks.